two overlapping tuff rings, one filled with rubble and the other capped with basalt. Several dikes exposed on the flanks between the two fed the flows. The large tuff cone was the first to erupt during a deep-water interval in contrast to the second surge when the magma encountered groundwater. It was pretty explosive in the Christmas Lake Valley area during the Pleistocene, is what they’re saying. Anyway, Lockwood and I abandoned poor Cujo at a somewhat shady spot and went hiking up the flanks of the tuff ring, encountering all sorts of delightful volcanic and sedimentary features. But we were not alone! We had help in our geologic explorations. 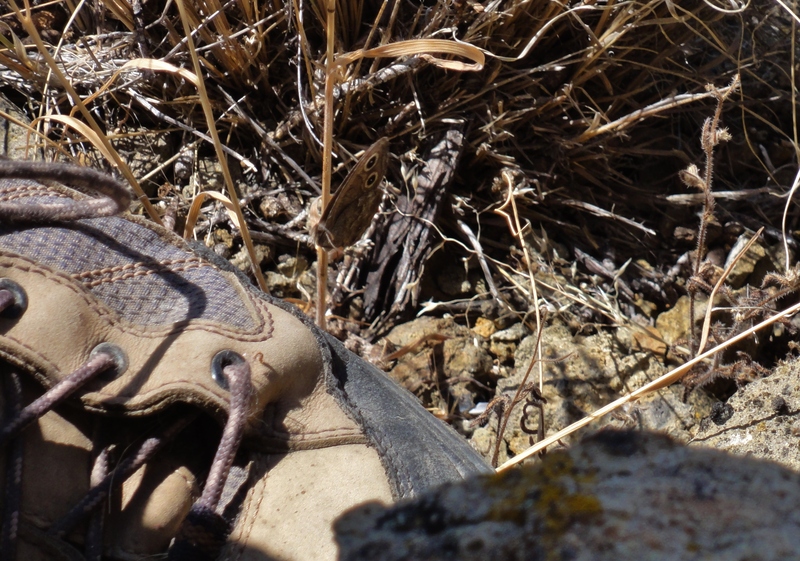 It had a particular fondness for Lockwood’s boot. In the background there, you can see some of the rugged basalt making up the Table Rock complex. The stuff’s a huge big mess – basalt erupting through groundwater and shallow lakes tends to get really frisky and fragmented. Lockwood has a very good explanation of what that rock is here. So there you are – a little geology with your cryptopod! And you can have a look at Table Rock here. 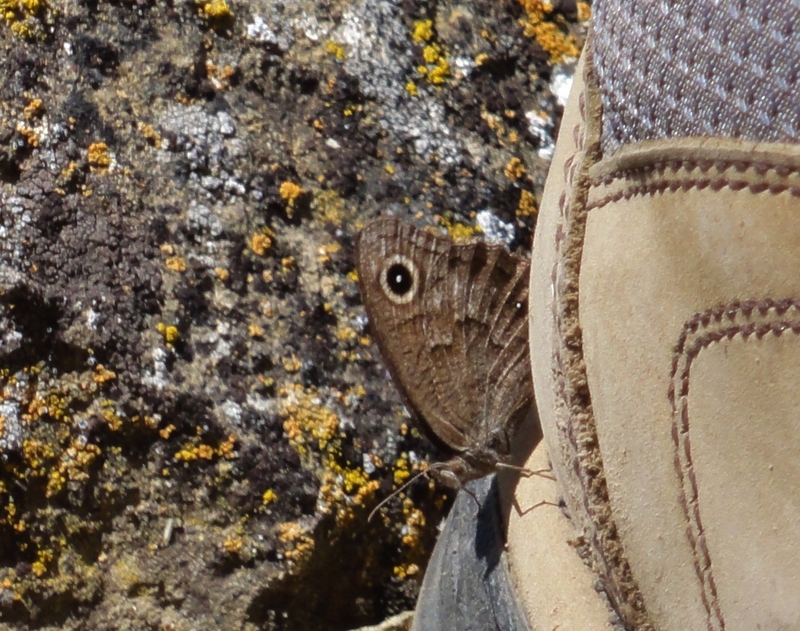 Meanwhile, we’ll zoom in to give you a closer look at our mystery butterfly. Such a sweet little brown thing, innit? A very nice compliment to some quite excellent geology. 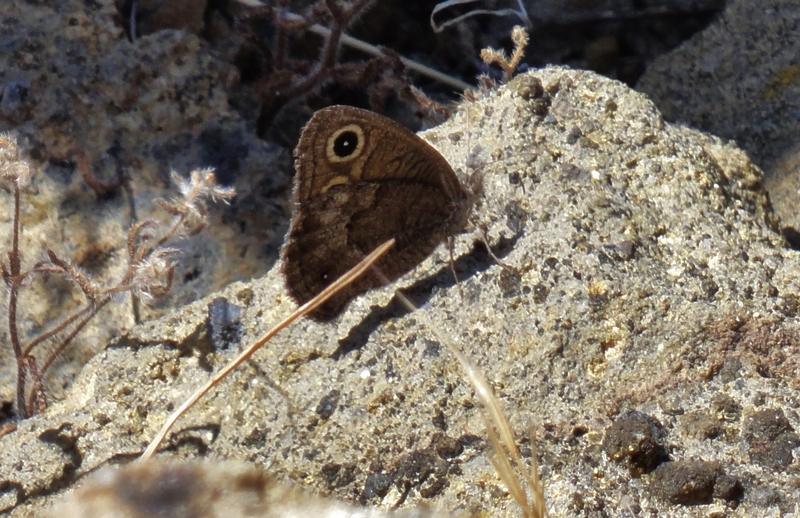 Something very closely related to the wall brown, I would guess. With less orange. 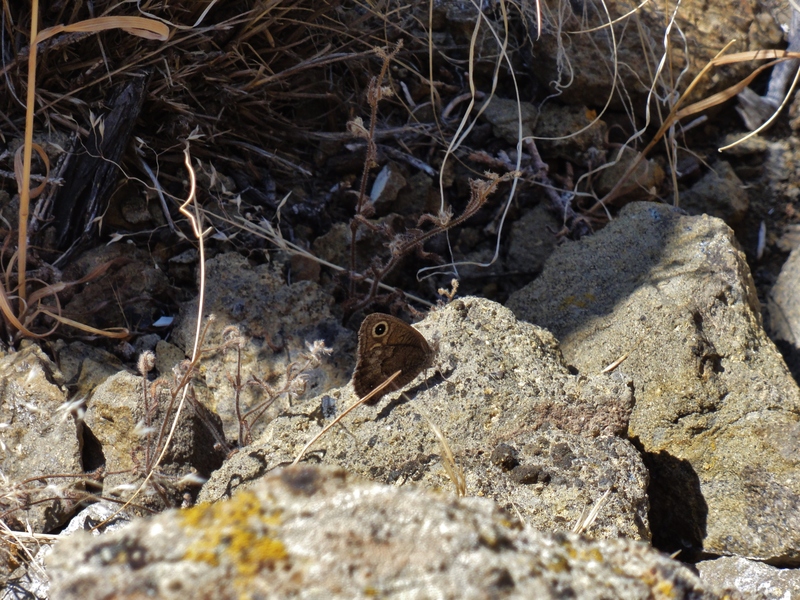 Perhaps the bush brown, though neither of these is indigent to North America, so that’s the best of my efforts for now. Looks like it might be a type of wood nymph? “To date, the highest number of photoreceptor classes in any one insect was nine,” said Professor Kentaro Arikawa of Sokendai (the Graduate University of Advanced Studies) in Hayama, Japan, who is an expert in the neuroscience behind insect vision.